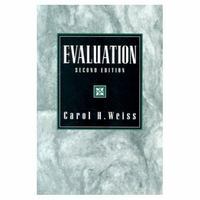 Evaluation 2 Edition This timely and accessible guide on the conduct of evaluation studies explores how we apply research methods in evaluating social programs, illustrating its points with reference to a variety of fields, including education, social services, and criminal justice. Offers practical advice on understanding the reasons for the study, identifying key questions to be answered, and planning and implementing the overall design of the study, including measurement, qualitative methods of inquiry, data collection, analysis, reporting, and dissemination. Stresses that understanding the underlying theory of the program is essential to developing the most appropriate evaluation, and emphasizes the need to take ethical considerations into account all along the course of the study. Covers meta-analysis, cost-benefit analysis and includes a non-technical discussion of the logic of data analysis. Includes references to further sources on measurement, existing longitudinal data sets, statistics, and qualitative analysis. For professionals in psychology, sociology, public health, public policy/affairs, education, and criminal justice.